The weak economy of the past four years combined with cutbacks due to mergers and acquisitions have helped consolidate U.S. biopharma activity further within the nation’s largest life sciences clusters. Yet that has not stopped several other U.S. regions from trying to carve out their own piece of the life science pie. 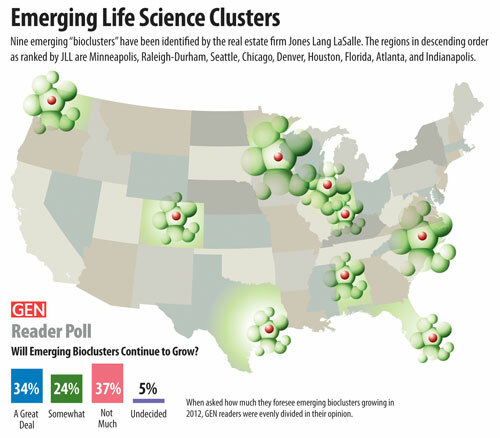 The real estate firm Jones Lang LaSalle (JLL) highlighted nine examples of what it called emerging bioclusters. The regions in descending order as ranked by JLL are Minneapolis, Raleigh-Durham, Seattle, Chicago, Denver, Houston, Florida, Atlanta, and Indianapolis. Arguably, though, the first three clusters on their list are far past that status. Minneapolis’ cluster has long been focused on medical device manufacturers anchored by the Mayo Clinic. Research Triangle Park, which includes the cities of Raleigh and Durham, has attracted several biopharma giants including Biogen Idec and Glaxo­SmithKline. Seattle has a growing research base: Leroy Hood’s Institute for Systems Biology completed its move within the city to an expanded headquarters in May. Additionally, Fred Hutchinson Cancer Research Center expects to complete work on a new building this year. Seattle is also home to the Bill and Melinda Gates Foundation. Erin Bovee, senior research analyst, life science with JLL, says the firm ranked 16 regions in which it does business on a scale of various criteria. Chicago and Denver scored highest in percentage of science and engineering graduates (fifth and seventh best, respectively); Houston, in NIH funding (seventh); Florida and Atlanta, in research space (seventh and third, respectively); and Indianapolis, in biomedical employment (sixth). Chicago and Denver scored highest in percentage of science and engineering graduates (fifth and seventh best, respectively); Houston, in NIH funding (seventh); Florida and Atlanta, in research space (seventh and third, respectively); and Indianapolis, in biomedical employment (sixth). Chicago hosted the 2010 BIO International Convention, while suburban Deerfield, IL, is home to the U.S. headquarters of Japanese pharma giants Takeda and Astellas. Lake Forest, IL, houses Hospira, which last month launched the first generic version of Merck & Co.’s Primaxin antibiotic in the U.S.
Last year Gov. Pat Quinn (D) enacted a $10 million tax program to aid state-based angel investors in startups in Illinois. In October Quinn launched Advantage Illinois, a $78 million federally funded portfolio of programs to fund smaller businesses seeking capital. Denver anchors a growing Colorado biopharma effort that will see the state divert part of the corporate sales taxes collected from biotech and cleantech companies between 2013 and 2023 to help fund startups in those industries under a law enacted in May by Gov. John Hickenlooper (D). Bio startups also saw welcome news earlier this month when the Fitzsimmons Redevelopment Authority announced plans for an $8 million, 37,000 sq. ft. “accelerator” space within its Bioscience Park for companies past the incubator stage. Houston benefits from two research institutions that have proven as adept at winning NIH grant funding as in carrying out top-tier research. Baylor College of Medicine won $215.2 million in FY 2011, and University of Texas MD Anderson Cancer Center racked up $152.3 million in FY ’11. Additionally, the $3 billion Cancer Prevention and Research Institute of Texas, which since 2010 has awarded $570.75 million in awards, has recruited about 24 cancer scientists to Texas. Florida has attracted more than a half-dozen research institutes by showering them with state tax incentives tied to promises of job creation. Policy initiatives were put in place a decade ago by then-governor Jeb Bush (R) and maintained by his successor Charlie Crist (R). But Crist’s successor, Gov. Rick Scott (R) sliced $4 billion from the state budget, including funds from an economic development program. The Jackson Laboratory was hoping to tap this money for a personalized medicine campus. After the state told Jackson Lab to seek far less than the $100 million it wanted, the Bar Harbor, ME, institute withdrew its request in June. Four months later the laboratory agreed to build The Jackson Laboratory for Genomic Medicine in Farmington, CT; Connecticut’s legislature authorized $291 million in bond funding toward the project in October. Florida is certainly not hurting for research institutes or academic space, though. The Sunshine State has 3.779 million square feet of it, according to JLL. Part of that space has been or is being built over the past decade for research institutions that include the Scripps Florida Research Institute, Max Planck Florida Institute, Sanford-Burnham Medical Research Institute, Torrey Pines Institute for Molecular Studies, The Vaccine and Gene Institute, and Mann Research Center. Among JLL’s emerging bioclusters, only Atlanta has more research space than Florida at 4.474 million square feet. Atlanta has benefited from the presence of CDC and the American Cancer Society as well as its universities. Atlanta’s home state has seen its workforce rise 1.3%, or by 198 jobs, to 17,926 jobs in life science companies, according to Georgia Bio. That total is surpassed by the sum of life science research jobs at colleges and universities (16,393) and CDC (7,551). Indianapolis has capitalized on the strengths of its workforce, according to JLL; Eli Lilly is headquartered in this region. Indianapolis has the largest concentration of Indiana’s life science workforce, according to Bio Crossroads. This includes 17,800 in drugs and pharmaceuticals, accounting for 35.5% of the total 50,000+ jobs. The figure has grown 21%, or by 8,800 jobs, since 2002. As busy as emerging biopharma clusters have been in recent years, however, their activity has been overshadowed by the ongoing consolidation by big pharma and big biotech within the top two clusters. “There’s a fundamental recalibration of the pharmaceutical industry that is under way,” says Dino Perazzo, an svp with real estate firm CB Richard Ellis (CBRE). As for emerging markets, “I don’t think they’re going away, but I don’t think 2012 or shortly thereafter is going to be the time at which those markets are going to grow,” adds Perazzo, who is also a director on the advisory board of CBRE’s Global Life Science Group. As long as big biotech and big pharma are scrambling to refill pipelines and slash costs, they will indeed steer significant activity to established clusters. Over time, though, that industry makeover is also supposed to involve outsourcing research and manufacturing operations as well as partnering with universities and smaller companies. At least some of that activity just might prompt companies to look beyond their home clusters and toward emerging areas. In the meantime, these new regions will have to prepare to address the challenges faced by the life science industry.